When neck pain limits your activities or results in chronic headaches and other debilitating symptoms, you can find effective relief from customized chiropractic care. The skilled chiropractic team at River Oaks Chiropractic Clinic in Fort Worth, Texas, offers several nonsurgical solutions for treating neck pain. Whether you need a spinal adjustment or ongoing rehabilitation services, the caring chiropractic team uses the latest techniques to alleviate pain and prevent long-term disability. Find out more about the benefits of chiropractic care for neck pain by calling the office today. Many factors influence the cause and severity of your neck pain. Routine activities, bad posture, and chronic disease can all play roles in the health of the soft tissues and bones in your neck. Issues that affect the vertebrae in your spine, such as herniated discs, can also lead to chronic neck pain. Damaged discs in the cervical vertebrae — the bones in the neck — can put pressure on your spinal nerves, making it difficult to move your neck without pain and/or limitations. How can chiropractic care improve neck pain? The chiropractic staff at River Oaks Chiropractic Clinic offers several treatments to improve the range of motion in your neck. During your initial evaluation, your chiropractor can evaluate areas of pain in your neck that limit movement. They can use manual manipulation or massage therapy to relax muscles surrounding your neck to improve your range of motion. The staff also provides alternative therapies, including acupuncture, to stimulate natural healing from the inside out. This type of treatment is effective at reducing inflammation and increasing blood flow to the damaged tissue or vertebrae. Manual adjustments can be useful in realigning the cervical vertebrae, while rehab therapies can improve the strength of the muscles that support your neck. How many treatments do I need for neck pain relief? The River Oaks Chiropractic Clinic team creates custom treatment plans to address your specific needs and the root cause of your symptoms. Depending on the reason for your neck pain, you could benefit from ongoing treatments to keep your cervical spine in alignment and reduce pain in the soft tissue. For some people, relief of pain and other symptoms can be possible after the initial treatment, while others need additional therapy to achieve maximum results. In addition to manual adjustments and other chiropractic techniques, your River Oaks Chiropractic Clinic provider can suggest lifestyle changes to reduce the risk of chronic neck pain and injury. These lifestyle changes can include exercises to improve your posture, especially if you spend a lot of time at a desk. You might also benefit from professional guidance on preventing neck injuries on the job or when participating in high-impact exercise or sports. 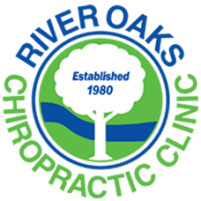 Find solutions for treating acute or chronic neck pain today by scheduling a consultation with River Oaks Chiropractic Clinic today, online or by phone.